Our trip began with an arrival at Rainbow Canyon on Saturday. We didn’t get any passes through the canyon and no aircraft in the surrounding vicinity but we heard a bunch of chatter over the scanners. We heard some Edwards’ F-35s performing some ops flying under the callsign of Jester as well as some radio communication to Viper, an Edwards’ F-16. There were also a few familiar callsigns from the Nellis AFB either flying a Green Flag or Weapon School op talking about an APC on the range. Sunday we expected to see pretty much nothing since there was no action through the canyon the previous day. We did end up seeing one of the General Electric 747 flying testbed aircraft at high altitude over the Panamint Valley. It was the new 747-400 they acquired flying under the callsign 747 Gulf Foxtrot. The original GE 747-100 was also up in the air but we only heard its callsign (747 Gulf Echo) over the scanner. We were surprised to see a Super Hornet appear and dive into the canyon especially since we didn’t pick up any radio call on the scanner. He turned wide out over the lookout parking lot and then dove very low into the canyon to the point where we lost him due to rocks obstructing our view. It was Vandy 11, the F/A-18E CAG (commander of the air group) bird for VX-9 Vampires. After the canyon, he turned north and climbed out of the airspace. We hoped he might pull another run from the canyon but we heard him call in over the radio for clearance to Moffett Field. Maybe he was headed up there to make preparations for the Super Bowl that was going to be held in Santa Clara a couple of weeks later or just flying to log in some hours. Needless to say we were stoked seeing the Vampires CAG bird on a Sunday; it was an excellent omen for the trip. On the way back to our hotel, we heard some radio chatter with Edwards Control about someone asking about the Sidewinder Route and an E-3 AWACS (airborne warning and control system), callsign Disco, cleared to start his descend down to Nellis. We drove out to the canyon early on Monday to make sure we would catch every aircraft coming through the canyon or flying in the vicinity. There was a lot of excellent radio chatter. He heard three F-35s flying ops out of Edwards and later they linked up with a KC-135, callsign Storm, to refuel. There was also action at NAS China Lake with a Vandy flight returning to base. Next, we heard Vandy 11 call in for the Star Wars canyon over the scanner. He was higher than Sunday, so we got some excellent shots. Shortly afterwards he called RTB (return to base) for China Lake. The Vampires were up flying all day, as was their sister squadron, the VX-31 Dust Devils. A few flew through the canyon on their way back to base including two Vampires aircraft (F/A-18D Hornet & F/A-18E Super Hornet) & a Dust Devil EA-18G Growler. There were a bunch of flights from NAS LeMoore flying high altitude over us all day. The fleet squadrons were out training and doing some ACM (air combat maneuvering) with the Vampires at times. We heard the squadron callsigns the scanner which included VFA-192 The Golden Dragons (Dragon), VFA-2 The Bounty Hunters (Bullet), VFA-154 The Black Knights (Knight), & VFA-122 The Flying Eagles (Expert). This day they all remained at high altitude including their brown camouflaged Super Hornet. 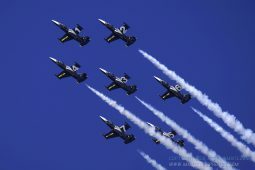 The Black Knights even had their CAG bird up in the high altitude flights. At one point we heard a Hornet in the valleys south of Rainbow Canyon in some of the other China Lake ranges. I was looking to the southeast toward Panamint Valley with the binoculars and spotted a Super Hornet coming toward us fast. 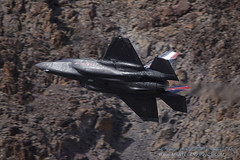 He must have been doing 500 mph as he zipped past us toward the canyon entrance and then pulled up and turned back for the Panamint Valley where he continued to perform low altitude maneuvers. Once he finished his solo maneuvers, he climbed to a higher altitude and engaged two Vampires Hornets in a dogfight. That evening we went out to shoot some pictures of the Milky Way and we saw a couple of Hornets flying high over Lone Pine. They flew in trail formation just making loops over the valley before flying to the northeast. For Tuesday we were hoping to see some similar action that we saw on Monday. 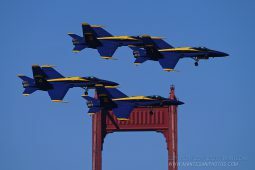 We were not disappointed because we would end up seeing sixteen aircraft fly through or near the canyon. There were plenty of radio calls for various aircraft to switch to the low level frequency. First through the canyon for the morning was an Edwards F-16 that stayed a little high. Next up was the brown camo jet from the Flying Eagles that we saw flying overhead the previous day. That was an excellent catch early in the day especially with the WSO (Weapons System Officer), or instructor for the flight, waving to us. A little later a grey Super Hornet came through from the Flying Eagles as well. Following him was the CAG bird from VFA-15 Valions who just cruised on through the canyon a little slower than most of the other fighters that come through. They were deployed to China Lake from NAS Oceana for some testing and training, so that was a nice surprise since you don’t often see a lot of the east coast squadrons out here. In some cases our scanner did not pick up the radio call from the jets entering the canyon or even entering low level ops so we stayed focused on the canyon entrance. At one point we heard aircraft down to the south, and it sounded rather high, when all of a sudden another Super Hornet was heading to enter the canyon. This one was the VFA-2 Bounty Hunters CAG bird, which was another great catch. Shortly thereafter we spotted a British GR.4 flying low through the Panamint Valley heading north. Unfortunately he did not go up and enter the canyon for a pass. Afterwards, a few grey Super Hornets from the Flying Eagles, Bounty Hunters, and Vampires came through the canyon. The Vampires Super Hornet had an inert JSOW (Joint Stand-Off Weapon) attached underneath one of the wings. Next, we got another CAG bird, and this time it was the VFA-145 Blue Diamonds. He stayed high and didn’t really enter the canyon but dove down and entered Panamint Valley low past the canyon. This is a good point to mention that we were flying an American flag every day near the edge of the canyon where we were standing. It, and we, didn’t seem to get too much additional attention until the next pass. A Vampires Super Hornet entered the canyon and did a regular pass, probably on his way back to base. I followed him through the camera and watched him turn around out in the Panamint Valley and point the nose directly at us. He then turned to the left a little toward the south and then pulled it back right to give us a nice knife edge angle with the mountains to the south as the background. He continued his turn and ripped right over us maybe a couple hundred feet over us. He then waved his wings and exited the airspace heading back to China Lake. Needless to say that completely made our day and it was only a quarter past one. We wouldn’t have to wait long either because an F-16 was headed for the canyon and very fast. It was a Lobos F-16 from the South Dakota ANG (Air National Guard) that were deployed to March ARB, and he was flying with live AIM-9 Sidewinders and AIM-120 AMRAAMs. As we were photographing him exit the canyon, we heard a second jet. I continued to follow the first F-16 and a second F-16 came into the frame. The second F-16 stayed to the north and then dove into the Panamint Valley behind the flight lead. They jinked back and forth for a little and then headed south through Panamint. 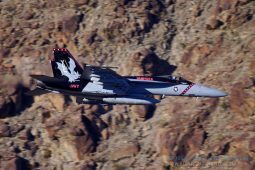 The brown camo Flying Eagles Super Hornet returned for another pass through the canyon and then remained low through Panamint. 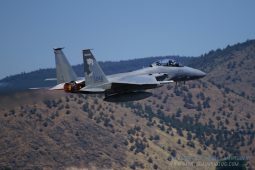 We also spotted a California ANG F-15C flying low through Panamint valley. After they cleared the airspace, a Super Hornet from VFA-147 Argonauts entered the canyon. About half way through he pitched up and then performed an aileron roll. The topper of the day though had to go to the Danish F-16 that is part of the Danish F-35 program. They flew to the south of the canyon and followed the highway down to Panamint. When they reached Panamint they turned around, climbed, and were flying over the valley to the north of us. That is when we could clearly see the tail and recognized it as the Danish F-16 from Edwards. They came around and flew over the canyon maybe a hundred feet over the rim, gave us a nice flat pass, and then pulled hard right and climbed to go around again. They dove and tilted the plane in our direction so we could easily see the pilot and copilot. The pilot was saluting us and the copilot was giving us the victory wave as they passed by. As they climbed, they performed an aileron roll before bugging out. The day finished out with another grey Super Hornet flying through the canyon before the sun went down behind the hills in the area. There were some other activities we watched throughout the day that were not in the canyon. 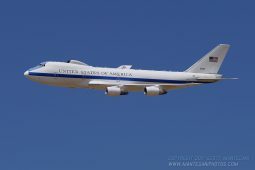 The GE 747-400 was up all afternoon flying a large racetrack pattern, roughly in the space of a rectangle, at varying altitudes well above all the training flights of the military aircraft on this day. Out to the south of the canyon there is a valley that is part of the China Lake range complex that appeared to have a radar range and some dirt roads and buildings for a training facility. The location was miles away from our position, but we could see dirt trails being kicked up from some cars or desert vehicles and one of the SH-60 Seahawk helicopters from China Lake. 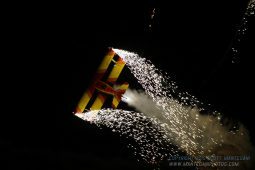 It was easily recognizable due to the white and orange SAR (search and rescue) paint scheme. It was flying around and landing at different locations so maybe it was doing some simulated rescue missions. We could also see a few of the Hornets that flew through the canyon maneuvering in the Panamint Valley from time to time. I’d like to mention that January out at Rainbow Canyon, and the Mojave Desert for that matter, is very cold. It was nineteen degrees at sunrise and then warmed up to forty to fifty degrees max. It is important to be prepared for the winter weather out there, especially when sitting all day waiting for fighter jets.